Saturday was tough on our bird friends. The winds were strong at around 40 kph and temps were down around 20. Snow flew and swirled all day long. I felt bad as the birds braved that wind, cold, and snow to get some of the food we put out for them. I'm linking to Mary's Mosaic Monday at Little Red House and to Sally's Blue Monday at Smiling Sally. Thank you to both for hosting! I love the blue bird! Happy Blue Monday, Sue. What a great post - for a blue Monday. 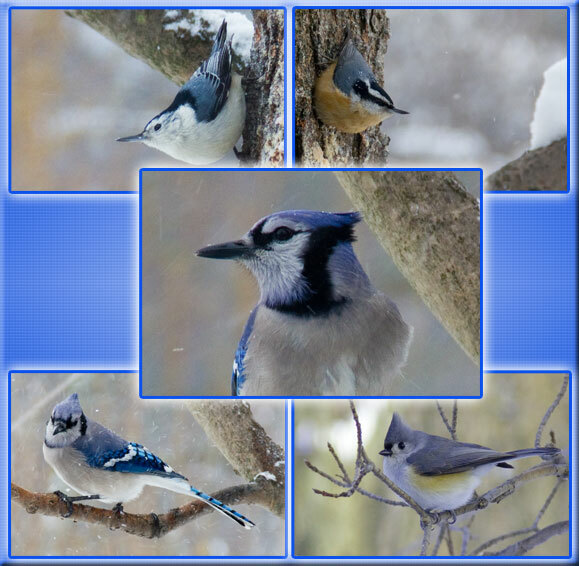 I think the blue jay is my favorite. The colors are so vibrant and unique. Thanks for sharing you beautiful birdies :-) Hugs!